In the quest for improved energy efficiency and lower energy costs, most parts of the globe have begun adopting LED technology. And the trend shows no sign of abating. A recent report by Navigant Research for the US Department of Energy states that by 2030 “LEDs are anticipated to [comprise] 84% of all sales by lumen-hours”. This, in turn, will drive 37% reduction in energy consumption in commercial and industrial buildings in 2030 alone. Though the initial investment in LED lamps is still higher than traditional lighting options, it’s more than offset by long-term energy cost savings and extended life span. They are also better for the environment, as they contain no mercury. For these reasons, LED lamps are increasingly replacing fluorescent lighting in offices, factories, hospitals, shopping malls, homes, and other spaces. They are also finding their way into the electrical infrastructure of these facilities, including inside power and control enclosures. If you’re a panel builder, contractor, or facility maintenance professional, you know how important it is to have good lighting inside of equipment cabinets. Your comfort and productivity depend on it. LED technology offers a more efficient alternative to fluorescent lamps, while also improving the quality of light. Thankfully, that light doesn’t include ultraviolet or infrared. UV light can weaken and discolor plastics, while stray IR can potentially interfere with IR-based communication, which is becoming more widespread. Avoiding these parts of the light spectrum helps protect the reliability of critical components inside switchgear and panels. It also attracts less insects! If you’re planning to use LED lamps to add to, or replace, lighting in your power or control enclosures, here’s a few important things to consider. Ticking off these boxes will not only achieve greater energy efficiency, but also help you get the most value for your money. How fast are the LED lamps to install? Time is money, especially for panel builders and contractors. Make sure the LED lamps you choose include the parts needed to install simply and quickly, ideally in only a few seconds per lamp. Will the lamps fit everywhere you need them? The newest LED enclosure lamps offer multiple mounting options. Beyond mounting to the enclosure frame, look for options to mount using magnets, or to a DIN rail, for example. You also want to make sure that, once installed, lamps won’t get in the way of maintenance activities. So, if possible, choose lamps that have a small footprint. Do the lamps support international standards? If you’re a panel builder or OEM serving more than one country, make sure the lamps support a variety of global standards. That includes product certifications and compatibility with as many voltage (and socket) standards as possible. Do the lamps support connectivity and control? In many cases, you’ll want to connect and power multiple lamps in series. Make sure you can connect as many lamps as you need to, across multiple enclosures, and can control them as a group. Some lamps offer the added convenience of a socket for plugging in a laptop or power tool. Will the LED solution save you money? Look for ways to save cost in installation and parts. For example, some lamps come complete with all parts needed for multiple mounting options, whereas other brands may treat these as optional extras. Some lamps are controllable from a presence detector, which saves time and cost by not having to install a door switch. Will you get the right amount of light where it’s needed? When it comes to lighting, the brightest isn’t always the best. Look for lamps that deliver an optimal quality of light for good visibility, but without causing eye strain. Also, LED lamps tend to be directional. Look for lamps with a wide dispersion angle to fully light all equipment inside each the enclosure. If wide enough, you may be able to light more than one cabinet with a single lamp, which can be another cost savings. You may also want the flexibility of having a few portable lamps for work bench and temporary maintenance work. Schneider Electric offers a complete range of LED lighting options for many types of power and control enclosures in worldwide applications. Designed for fast installation, a choice of 3 models support multiple mounting configurations, while delivering comfortable and effective light quality, and extensive connectivity and control. 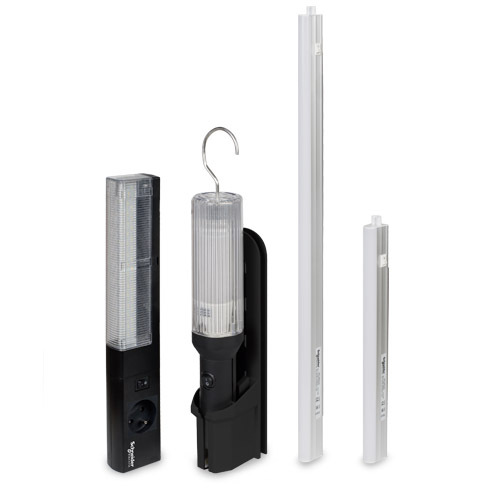 For more information on the products discussed in this blog, please see our lighting solutions page or visit our universal enclosure solutions page. One thing to mention is the flicker index, this is something that will soon be labeled on all LED products. Flicker index represents if LED light flicker or not. Flicker issue is well known on fluorescent-lamp, and this is something you just have to avoid if possible.